Daheitian is known as Mahakala in Tibet. He is believed to be Lord Siva in India. While in Japan, he is one of the seven wealthgods in Japan. Some Buddhists believe He is the the manifestation of Kwan Yin Pusa to bless wealth on earth. Wealthgod Daheitian started to be worshipped about 1200 years ago by general laymen in Tibet after they found out the secret of survivability of 3000 monks in an ancient Monastery. The monks focused on attaining enlightenment and without having to worry about financial acquisition because the monastery was self sustainable with the blessings from the Daheitian. Daheitian normally wears a black head scarf. On one of his arm, he carries a wooden hammer. And on the other shoulder, there is a sack of wealth bag. Under His feet, there are two rice bags. One can find his large statue in a temple in Tsim Sha Tsui if one ever visit Hong Kong. There He is worshipped by almost every Hong Konger who wishes to become rich and wealthy. And almost every household in Hong Kong will have His figurine at home because of popularisation by high ranking feng shui masters in Hong Kong. Many feng shui enthusiasts would actually display his figurine on top of a closed wealth box or on top of an opened bowl filled with gemstones, gold ingots, coins and other treasures. Ebisu is one of the Seven Gods of Good Fortune (Shichifukujin). Ebisu is regarded as the tutelary deity of all occupations, but especially of fishing, farming and commerce. The main attribute of Ebisu is a freshly caught red snapper under his left arm. He is a plump figure with a broadly grinning face. 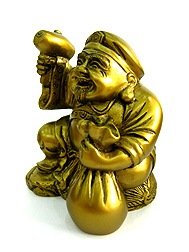 His happy expression and attributes of prosperity make him a popular god among merchants. 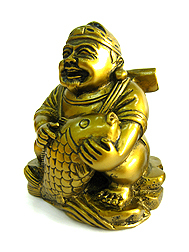 Ebisu is frequently paired with the god Daheitian who is also one of the Seven Gods of Good Fortune. The two gods are often enshrined by the Japanese. That is a good indication of how much wealth can be brought by these wealth gods, because almost all japanese are quite rich! Those seeking for divine help can count on these wealth gods. They not only bring you wealth opportunities, but also protect your wealth from being lost. 1. Display them in your living or family rooms, business premises and offices, especially in southeast corner (wealth corner) to activate and enhance your wealth luck. 2. 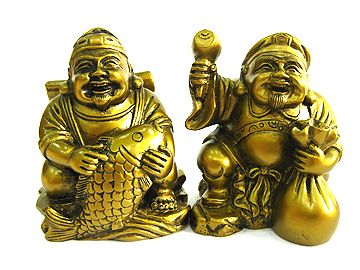 Display them facing your entrance so that you can see them as you enter to invite wealth and multiple fortune luck into your homes at chi entry points. They also provide protection of your wealth. 3. Display them in your office and shops to ring in more sales and achieve more monetary gains and successes. 4. Display them in the Northwest sector to activate your mentor luck for money finding opportunities. They clear your minds off all business negativities and bless you with positive energies to find more money for yourself. 5. Their images are a must for japanese tycoons and for those doing any kind of business seeking for success. 6. If you're the boss, display them in your office or behind you for wealth protections and for business to leapfrog to another level of excellence. Note: Kindly do not place them on floors, bedrooms, kitchen and toilets.